Hi Everyone! I know you’ve probably all been wondering where I’ve been the past couple weeks. In case you haven’t guessed from the picture – this Bay Area girl is making a big move to… Ann Arbor, Michigan! That’s right: after living my entire life in the Bay Area, I’m off to start a new adventure in the Midwest. 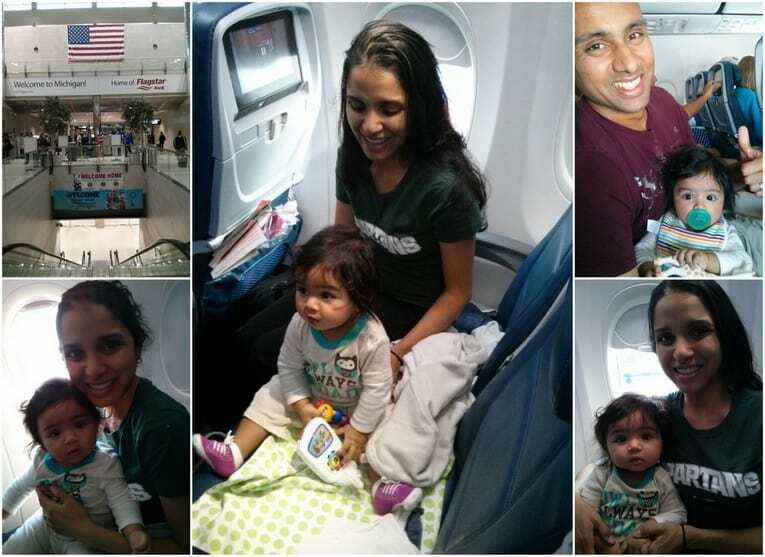 The husband just got an amazing tenure-track job at Michigan State (hence my Spartans t-shirt), and so we took Layla on her very first flight about 1.5 weeks ago and moved cross-country! The past few weeks have been unbelievably hectic: between packing, moving, waiting for our stuff to arrive, unpacking, settling in, exploring the area, etc. – as I’m sure you can imagine. But don’t worry – there will be plenty more Picky Eater approved recipes coming your way very soon 🙂 This has truly been the year of major life changes for us and I really appreciate all of you sticking with me throughout all of it. Just in time for Labor Day: my Labor Day Recipe Guide! One Week of Healthy Meals On a $100 Budget! Lastly, here are some pictures of all of us in our place this morning, surprised by a SF themed care-package from my brother and his girlfriend! See you all back here (with delicious fun recipes) very soon! Aww look how big and adorable your little princess is, what a beautiful family. Ohmygosh that’s the exact same move I did 🙂 Bay Area girl = transplant in the Mitten State right now 😛 Hope the move has been going smoothly and have fun–the real seasons are a trip! Haha no way!! That’s awesome – sounds like we are in exactly the same boat 🙂 How long have you been in MI now? How are you liking it compared to the Bay? Do you live near Ann Arbor because if so, I’d love any foodie tips from you on where to eat and things to do! So far the move has been going smoothly – super busy getting settled in but that’s to be expected I guess 🙂 Can’t wait to experience my first real fall and winter soon! Outside AA: If you have a car, you absolutely must visit Dearborn for Middle Eastern food! Hit up Al-Ameer for the main courses and then Shatila down the street for dessert 🙂 My favorite restaurant in MI so far is Ajishin in the nearby city of Novi. The wait can be long, but it is a very authentic and inexpensive Japanese establishment. Wow, long comment–anyways, let me know if you have any other questions, and I wish you well in your settling-in and food explorations! This is awesome and super helpful!! 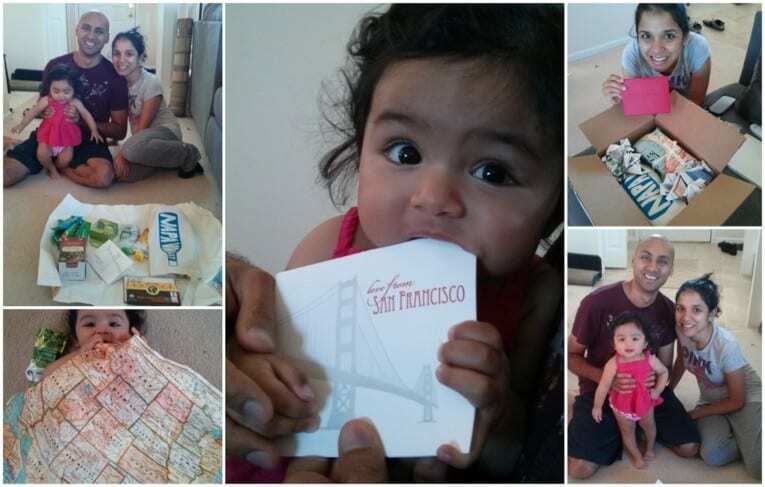 Thank you so much Amy – I can’t wait to try some of the places you’ve suggested! That is a big move!! A whole new city to explore! I wish you and your family all the best and enjoy this new adventure. Good luck to your husband. Layla is such a cutie!!!!! She seems to be a great traveller for her first time. Thanks so much for the kind words Celine!! I’m definitely excited to explore the food scene in Ann Arbor! Oh wow! I didn’t know you lived in Chicago – that’s awesome 🙂 And yes it will definitely be an interesting adjustment with the snow this winter! We are tired haha – moving with a baby is as exhausting as you might imagine!! Once we finish settling in we’ll be catching up on some rest for sure! Thanks so much John!! Hope your move goes well! I meant your husband (not you’re). I’m not making U of M look good am I, ha! Hahaha 🙂 Just replied to your other comment and then saw this. No worries!! Awww thanks Deanna! And omg congrats on your baby on the way as well as your move! What an exciting time for you guys! And that’s so awesome that you went to UofM! You’ll have to send me any Ann Arbor recs you have on places to eat, things to do, etc. My husband is working for MSU but we are living in Ann Arbor, not Lansing – he’s going to commute so that we can be closer to my work. So I guess we’ll just have to be secret MSU fans in a land of UofM fans 🙂 Although, I’m probably going to stick to being a Cal Bears fan at heart, since that’s where I went to undergrad! haha! Thanks Parita!! We are slowly settling in, exploring the area and are almost done unpacking! Hope you’re doing well! congrats! good luck with everything!, and by the way what a beautiful family! Congrats Anjali! This is such exciting news! I’m soooo happy for you and love love Layla’s new pics! She’s getting so big and still is cuter than ever! Hehe thanks Pri!! Will definitely post some photos soon 🙂 It’s probably double or triple the size of our other (small apartment) kitchen!